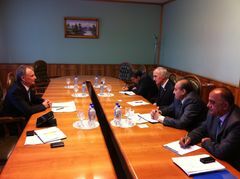 During the visit, Mr. E. Biriucov had several meetings with: Mr. Davlatov M.S., Chairman of TRACECA National Commission in Tajikistan, first vice-prime minister, Mr. Khakimov N.H., minister of transport, Mr. Solih Muminov, National Secretary of the PS IGC TRACECA in Tajikistan, as well as the representatives of the TRACECA National Commission in the Republic of Tajikistan. At the meetings, the parties discussed the priority issues of cooperation in the context of development of the international transport corridor “Europe-Caucasus-Asia", other issues, strategic and integration prospects of the region for further implementation of the idea of the Great Silk Road development. There were also exchange of views on the possibilities of coming to a common understanding with regards the existing barriers on the way of freight transport along the TRACECA corridor and particularly obstacles faced by carriers in Tajikistan. 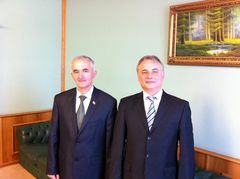 Parties noted that the Government of the Republic of Tajikistan has adopted several measures as the prospects for the development of international transport corridors and improvement the quality of freight on international communications, including a list of approved routes of international transit of vehicles on the territory of the Republic of Tajikistan. 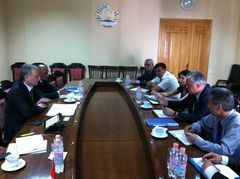 Following the meetings, participants defined the main directions of joint activities aimed at the implementation of the basic provisions of the Basic Multilateral Agreement on International Transport for Development of the Europe-Caucasus-Asia corridor under the chairmanship of the Republic of Tajikistan in the Intergovernmental Commission as well as the Action Plan for the year of 2013. Mr. Biriucov, TRACECA Secretary General emphasized that Chairmanship of Tajikistan in the Intergovernmental Commission TRACECA will provide opportunity to make decisions that determine the vectors of development policies and international transport cooperation among countries of TRACECA as well as between the TRACECA countries and the European Commission. In this regard the parties noted the key role of all state institutions of MLA member-states in the implementation of the goals and objectives of the TRACECA Strategy up to 2015. TRACECA is of special interest for Tajikistan since the corridor provides up to 70% of the total transport of cargo to/from the country. 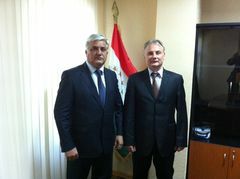 Mr. Biriucov has expressed full support to Tajikistan’s efforts to attract investments to the transport industry of the country to create favorable conditions for the use of highways and infrastructure, including logistics centers. It should be noted that the most important subject of discussion between Tajikistan, Afghanistan and China is a project to build a railway line Kolhozbad - Nizhniy Panj and Wahat Karmyk presented within the framework of Investment Forum 2012 in Brussels. Mr. Biriucov visited a logistics terminal "Tursunzoda", located on the border of Tajikistan and Uzbekistan and learnt the progress of the project of reconstruction of the Dushanbe-Dangara road and construction of the tunnel "Chormagzak" with total length of 4430 m. Putting the tunnel "Chormagzak" into operation would reduce the distance between Dushanbe - Vahdat – Kulyab to 100 km compared to Dushanbe-Kurgan-Tube-Kulyab road.